Born July 19, 1909. Died September 2, 1978. Brigadier General U.S. Air force-- Author. He wrote "Red Ball In The Sky." He was a pilot with the first squadron of jets to fly over the North Pole. He was married to Maureen O'Hara. He is buried in Arlington National Cemetery, Section 2, Grave 4966. Maureen O'Hara's career basically ended with The Rare Breed (1966), and she has acted only five times the last 30 years. The reason was her marriage to retired Air Force General Charles F. Blair, Jr., in 1968. Blair was noted for making the first solo crossing of the North Pole in a single engine plane and being an aviator-turned-astute-businessman. "I quit making movies when I married Charlie," she said, "and went into aviation. I also published a magazine in the Caribbean. It was worth quitting the movies to go with him adventuring around the world." O'Hara did return to Hollywood for the lame generation gap comedy How Do I Love Thee? (1970), co-starred a final time opposite Wayne in Big Jake (1971), and joined Henry Fonda in a television remake of John Steinbeck's The Red Pony (1973). The Blairs were quite wealthy making their home base a magnificent house on St. Croix in the Virgin Islands, and O'Hara became a rare Hollywood visitor. Then a run of misfortune befell her. Blair died unexpectedly in a 1978 plane crash, and shortly afterward she experienced a bout with cancer. "I had surgery," commented O'Hara on her illness, "and I'm fine now. We call it 'joining Duke's club.'" Hurricane Hugo destroyed her home in 1989, causing O'Hara to come full circle when establishing her new residence in Ireland. 1951 First solo across North Pole. Charles F. Blair, Jr., flew a converted P-51 (May 29). Maureen O'Hara married General Charles Blair, the love of her life in 1968. Although he was tragically killed in a plane crash ten years later, he brought to Maureen the happiest years of her life. Following is a biography supplied by Maureen of her beloved Charles. another, much more than a way for a pilot to make a living. Flying was a way of life. "The sky is full of new frontiers," he once wrote and he never ceased believing that. Throughout his long and colorful career, the frontiers of the sky were a constant challenge. A senior pilot for Pan American World Airways for 29 years including 10 years with American Overseas Airlines (which merged with Pan Am), and for another major US airline before that. Captain Blair was one of the most experienced airmen in commercial aviation. Yet through the years he found time to test dozens of new aircraft, survey new air routes to the far corners of the globe, and develop scores of new navigational and operational techniques; to serve as a respected advisor to aircraft manufacturers and the US military; to found and operate two successful airlines of his own; to write books and magazine articles about aviation; and to set an impressive series of flying records, some of which have never been equaled. For his achievements, Captain Blair became one of the most honored flyers in history. With his untimely death in a crash of an Antilles Air Boats plane off St. Thomas in the U.S. Virgin Islands in 1978, aviation lost an outstanding leader. The following pages present the highlights in the extraordinary life of this extraordinary man. 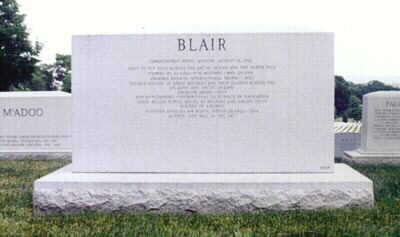 Charles F. Blair was born in Buffalo, New York on July 19, 1909. He learned to fly at the Ryan Flying School in San Diego, California, and he soloed there in 1928 at the age of 19. In 1931, after receiving his Bachelor of Science degree in Mechanical Engineering from the University of Vermont, young Blair entered the Naval Flying School at Pensacola, Florida. He graduated the following year August 16, 1932 with Naval Aviator designation #4748 and the rank of Ensign in the United States Naval Reserve. Shortly afterward, he was assigned to Patrol Squadron VP-7F, Naval Air Station, North Island, San Diego, California. After his release from active duty in 1933, he flew for seven years with United Airlines, pioneering mail routes in the rugged U.S. West. In 1940, he was named chief pilot of a newly formed overseas airline, American Export Airlines, later to be known as American Overseas Airlines. All of the airline's survey flights and first scheduled flights between the United States and the British Isles, Africa and South America were made under his command - as was the first nonstop commercial flight across the Atlantic, which he made in a Sikorsky VS-44 flying boat. He also employed and trained all of the airline's pilots. During World War II, Captain Blair flew for both NATS (Naval Air Transport) and the Air Transport Command. He also flew as production test pilot for the Grumman Aircraft Company testing the F6F, F7F and the F8F Navy fighters, and he flew the original Martin Mars flying boat as consulting test pilot. In 1943, he proposed and flew the first North Atlantic winter airline operations flight nonstop between the United States and the British Isles, again in a VS-44. In 1944 he was pilot in command of the five fastest seaplane crossings of the Atlantic on five consecutive trips. His best time: 14 hours and 17 minutes. Associated Air Transport, Inc., a small non-scheduled airline flying between New York and Europe, the Middle East and South America. Most of the flights were made in a single, personally owned "long-range" C-46. After 16 million uneventful" passenger miles, the company was sold. Captain Blair became a Pan Am pilot when AOA merged with Pan American World Airways in 1950. That same year, he purchased from Paul Mantz, a well-known Los Angeles flyer, a single-engine P-51 Mustang fighter in which Mantz had won the Bendix Trophy in 1946 and 1947. Although its technical characteristics remained essentially those of a standard P-51, Captain Blair made a number of modifications, including the installation of a more efficient Rolls-Royce 1650-HP Merlin engine, long-range fuel tanks and special navigation equipment. (It was later revealed that he bought the plane only after the U.S. Air Force had refused to lend him one of theirs because they considered the missions he had in mind were "impossible"). On January 31, 1951, Captain Blair flew his Mustang - which he had named "Excalibur III' non-stop from "New York to London's Heathrow Airport. One objective of the flight was to test the effects of the then-relatively unknown high-altitude phenomenon called the "jet stream." Captain Blair encountered the high-velocity westerly winds at 37,000 feet precisely as he had planned, and the resulting tail wind, in his words, "blew me to London." He covered the 3,478 statute miles at an average speed of 446 miles an hour. His elapsed time of seven hours and 48 minutes set a record for a transatlantic crossing by a piston engine plane that still stands. was also awarded the Gold Medal of the Norwegian Aero Club, only the 16th time in 43 years anyone had been so honored. "Excalibur III" the scarlet P-51 in which he had made his historic flights, is on permanent display at the National Air and Space Museum in Washington, D.C.
promoted to Brigadier General in July 1959. Although these were Reserve ranks, he worked primarily with the Active Air Force. Between 1953 and 1958, Captain Blair spent between 150 and 200 days a year in a combination of active Air Force duty status, reserve drills, and as a consultant to the Director of Operations, Headquarters, U.S. Air Force. During the 1950's and 60's, he flew most of the Air Force's first-line aircraft, making numerous supersonic and Mach 2 flights; was involved in various low altitude navigation and weapons delivery programs; and engaged in air-to-air gunnery exercises, including successful firings of the GAR-8 and GAR-10 missiles. In 1956, he commanded three F84F tactical fighters in "Operation Shark Bait," the first non-stop flight of jet fighters across the Atlantic, using the Great Circle Route. From 1957 to 1960, Captain Blair worked with the office of the U.S. Assistant Secretary o f Defense for Research and Engineering on a new, light-weight, all-weather, low-cost navigation system for low-level NATO strike fighter operations. His proposed system was successfully tested. In June 1959, he received the Thurlow International Award of the Institute of Navigation for his "outstanding contribution to the science of navigation." In August 1959, he commanded two F-100s in "Operation Julius Caesar," a nonstop flight from Weathershield RAF Station, England to Eielson Air Force Base, Alaska - the first jet fighter flight over the North Pole. The purpose of the flight was to test the feasibility of deployment routes between the Far East and Europe for jet fighter-bombers, and also to test automatic Doppler navigation system performance. The F-100s refueled in mid-air three times during the 9-hour flight, the final time directly over the Pole. For commanding this operation, Captain Blair was awarded the Distinguished Flying Cross. In 1962, Captain Blair added to his responsibilities by joining the U.S. National Aeronautics and Space Administration as a consultant on operational and navigational problems related to proposed supersonic transport aircraft. In the late 1960's he wrote a book, "Red Ball in the Sky," which was published by Random House. He had previously co-authored with A.J. Wallis a novel about flying, "Thunder Above," that was made into a British motion picture. His magazine articles appeared in the Saturday Evening Post, Readers Digest, True, Popular Science, Flying and many other publications. Throughout this very active period of his career, Captain Blair continued to serve his regular tours of duty as a Pan Am senior pilot. One of the first airline pilots to fly the new jet transports, he commanded Pan Am's Boeing 707s on the airlines round-the-world schedule between New York and the Far East via Europe, and to Rio and Buenos Aires on its South American routes. founded Antilles Air Boats, Inc., based in St. Croix in the U.S. Virgin Islands. When he retired from Pan Am, he decided to personally head his airline's operations, expand its fleet and services, and served as one of its pilots, as well as its president. Antilles Air Boats prospered and grew. By 1977, it had a fleet of 23 amphibious aircraft - 19 Grumman Gooses, two Grumman Mallards and two UK-built Sandringhams - and was offering 120 flights a day to destinations throughout the Caribbean and carrying more than 250,000 passengers a year. While it billed itself as "the world's largest seaplane airline," Antilles Air Boats was also known as "The Streetcar Line of the Virgin Islands." Captain Blair, in addition to running the company, was flying between 40 and 50 hours a month. 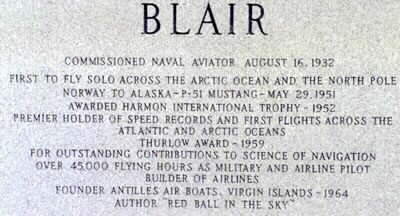 By this time, Captain Blair could look back on 46 years as a military and commercial pilot, during which time he had logged more than 10 million miles and 45,000 hours at the controls of aircraft ranging from small single-engine propeller planes to giant globe-circling jets, and he had commanded 1,575 Atlantic crossings. Then, on September 2, 1978, tragedy struck. Captain Blair was piloting a Grumman Goose from St. Croix to St.Thomas when his plane developed engine trouble and crashed. He was killed instantly. 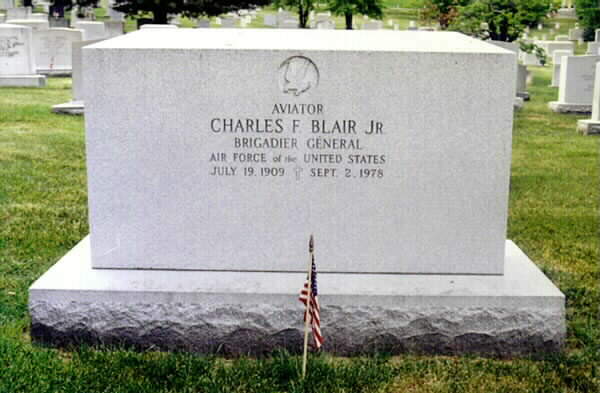 Charles F. Blair, as a Brigadier General in the U.S. Air Force Reserve, was buried with full military honors on September 11 at Arlington National Cemetery outside of Washington, D.C. Survivors included his wife, Maureen O'Hara Blair, whom he married in 1968, and four children from two previous marriages: Suzanne, Christopher, Charles Lee and Stephen. The most recent of many tributes to Captain Blair was the unveiling of a memorial in his honor at Heathrow Airport in London, terminus of his 1951 record-breaking transatlantic flight. Consisting of a large-scale replica of his famous Mustang, Excalibur III, the memorial was dedicated on January 30, 1981. Present at this ceremony were Captain Blair's widow, who performed the unveiling; representatives of Pan Am and other companies; aviation notables; the press; and many of Captain Blair's friends. Plaques located near the memorial give the highlights of Captain Blair's career and constitute a permanent record of his achievements. This memorial was made possible by contributions from Captain Blair's friends and fellow employees of Pan Am. "The sky is full of new frontiers." The career of Charles F. Blair was a living expression of that philosophy and of his love of flying. His life will always be an inspiration to flyers everywhere.